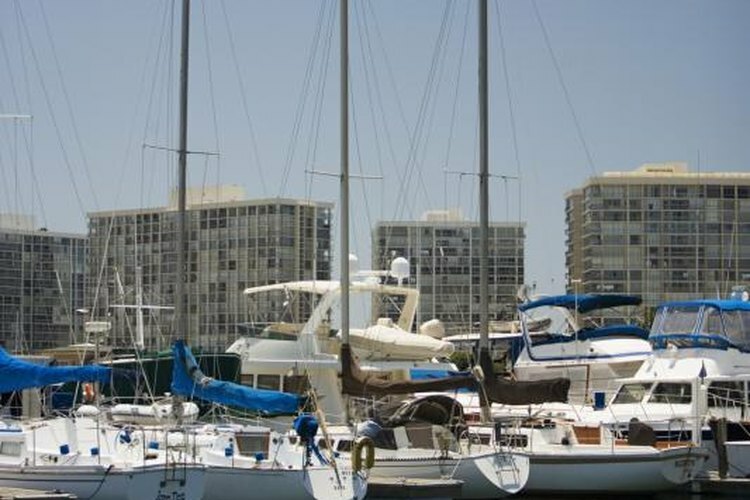 Sailing and motor yachts share space in San Diego's marina. A yacht has been referred to as "a hole in the water into which you pour money." And financier J.P. Morgan responded to someone who asked how much a yacht costs to maintain with, "You have no right to own a yacht if you ask that question." A yacht may be accurately described as a very large motor or sailboat, used for personal cruising, racing or general recreational activity -- so, money. Middle class boaters make up the vast majority of recreational yachting aficionados; the stratospheric heights of yachting are another story. Yachts are generally defined as monohulls -- boats with a single hull. With a few notable exceptions, the category does not include catamarans or trimarans, which may be large and luxurious but have multiple pontoons. There are motor yachts solely powered by engines, and sailing yachts powered by the wind or diesel engines. Sailing yachts may be further divided into cruising, or recreational, yachts and racing yachts. Cruising yachts have live-aboard amenities such as full heads; berths; cook's galleys; large cockpits for relaxing as well as steering the boat; storage for limited clothes, media and lots of boat gear; and other niceties. Racing yachts are stripped down for light weight and more speed and may have nearly bare cabins with essential gear and safety equipment, to be used by crews of a dozen or more sailors, each detailed to a specific task during the race. A "modest" yacht, affordable for recreational boaters, casual weekend racers, and sailors, ranges from about 40 to 100 feet. Luxury yachts are another breed -- with their own helipads, submersibles, enough state rooms for a boutique hotel, formal and informal dining areas, crew quarters and state-of-the-art technology sufficient to run a small nation. The simplest of the luxury yachts start at about 100 feet and top out around 200 feet, and may or may not feature the ostentatious provisions of the super yacht. A super yacht is anything over 200 feet and operates as a self-contained environment -- some even have their own saltwater converters to supply potable water from the sea. The America's Cup began as a brash American challenge to the British Royal Yacht Squadron's "Hundred Guinea Cup" around the Isle of Wight in 1851. A sleek black schooner from the New York Yacht Club, named "America," couldn't raise a match race with an English yacht, so it joined the scrimmage around Wight and won it easily. Eventually, the race was renamed the America's Cup, in honor of the intrepid "America," and the race trophy from the now-international event was successfully defended by the New York Yacht Club from 1870 to 1983. That legendary winning streak is unmatched in sports history, according to the NYYC -- an illustrious institution founded in 1844, and a less-frequent challenger these days for the increasingly high-tech America's Cup. The Vikings were pretty slick at designing boats for speed; their double-ended, dragon-headed longships were the 9th- to 12th-century equivalent of today's racing yacht. The single, shallow keel, overlapped long flexible planks, light construction and fast-reefing sails sent the raiders skimming across the sea to plunder and make a quick escape. Modern marine hydrodynamics, aerodynamics and carbon-fiber composites have reshaped the hulls that win for speed today. The venerable America's Cup is now challenged by multihulls built with rigid wings, not sails. The long, thin hulls made of space-age materials cut through oncoming waves, and hydrofoiling daggerboards extending below the center of the hull help to push the boat out of the water but prevent it from losing all contact and sliding sideways. Multihulls were first admitted to the historic yacht race in 2010. Yachting Magazine: Who Owns the Most Superyachts?